Football is back and Real Madrid presented their fans with a tremendous show, after turning a 2 goal disadvantage score, in less than 25 minutes. Malaga found their way to the goals through two corner kicks and attempted to defend the result at all costs, but the Merengues showed once more that in the Bernabéu an attacking football style still prevails. These holidays break seem to have slowed down the Merengues for a bit, but a 2nd half wake-up call proved to be enough to turn around the 0-2 score and beat Malaga by 3-2. Sami Khedira (68'), Gonzalo Higuaín (69') and Karim Benzema (78') led the "remontada" which will allow Real Madrid to face Malaga next week for the 2nd leg of the Copa del Rey, with a 1 goal advantage. Cristiano Ronaldo played the full 90 minutes but he couldn't find the back of the net, despite having scored an acrobatic goal that has been disallowed, just a few seconds before the final whistle. The game soon gave indications that it wasn't going to be an easy task for Real Madrid. Around the 10th minute, Malaga won a corner kick and the talented Santi Cazorla took a brilliant cross to Sánchez head, who had no problems in making it 0-1 for the visitors. Real Madrid was having more ball posession, but weren't capable of creating big goalscoring chances by that time. Cristiano Ronaldo attempted to assume the responsability of leading the charge against Manuel Pelegrini's side, but Malaga always closed all the spaces in their back line, never allowing the Merengues to put them into real trouble. A more surprising goal would arrive near the 30th minute of the 1st half and again, from a corner kick taken by Cazorla. This time, the main "actor" was Demichelis, as the Argentinian managed to escape Pepe and anticipate Iker Casillas, in order to head the ball to back of the net. Without really making enough to deserve it, Malaga found themselves with a 2 goal lead, with still 60 minutes to be played in the game and after scoring their two goals from corner kicks. Real Madrid revealed a worrying weakness in their aerial game, that can be easily understood if we have in mind that Sergio Ramos missed this game because of a harmstring injury. Half-time reached and Real Madrid players left the pitch knowing that José Mourinho was about to unleash all his fury in the locker room. Even though we don't know the exact speech the Portuguese coach decided to grant his players, Mourinho referred on the post-match interview that if he had been possible, he would have replaced the entire line-up for another 11 players. However, rules say that a team can't replace no more than 3 players and that's exactly what Mourinho did, by subbing Callejón, Kaká and Arbeloa, bringing in Ozil, Benzema, and Khedira. 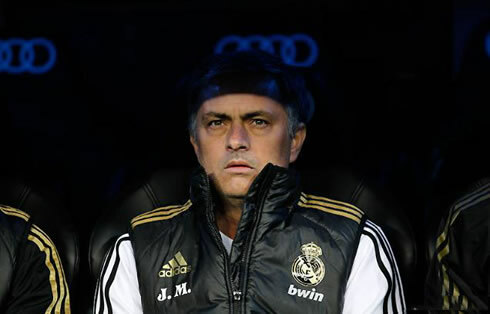 The Portuguese manager isn't called the "Special One" by chance, and the Bernabéu was about to witness a true "Remontada", induced by José Mourinho decisions and half-time talk. Malaga resistance lasted until the 68th minute, just moments before one of the men that Mourinho brought in, Sami Khedira, entered his opponents area like a thunder and fired a crossed shot that Cabellero simply couldn't handle. The wake-up call was given and the Santiago Bernabéu roared, anticipating the "remontada". Less than a minute later, Malaga defender Sánchez appeared to still be a bit dazzled by the Merengues goal and made a bad pass to his goalkeeper. Gonzalo Higuaín seized the opportunity and rounded the goalkeeper to equalize the game. Not that it is necessary to say, but the crowd simply went wild. Even though this Copa del Rey stage is played in a 2 legs round, Real Madrid was not going to let the opportunity of completing the "remontada" to slip away. Close to the 78th minute, Gonzalo Higuaín had a stunning assist to Benzema, from a sort of a backheel pass, which the French player didn't waste and striked the ball to the back of Caballero's net, for the 3rd time in less than 10 minutes. From that point on, Real Madrid backed off a little and made sure that Malaga wouldn't reach the equalizer. Just a few seconds before the match ended, Cristiano Ronaldo also scored a goal, but it has been disallowed for off-side, in what would have been a truly screamer. Ronaldo had an acrobatic 1st touch shot, finishing a cross made from the right wing in great style, but once again and after the brilliant goals against Spain and Azerbaijan, the Portuguese player saw his brilliant goal being disallowed. Real Madrid next game is against Granada, for La Liga, in the 7th of January, 2012. In the meanwhile, this Wednesday you can watch Newcastle vs Manchester United for the English Premier League, and Barcelona vs Osasuna for the Copa del Rey. This Saturday, Ronaldo steps up in Real Madrid vs Granada for the Spanish League La Liga, all available from our soccer live streams section.